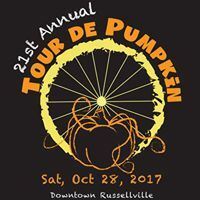 The annual Pumpkin Ride offers a 64 mile ride this year. Begins in downtown R'ville at the Train Depot, 320 West C Street, Russellville, AR 72801. They have a chili cook off on the street as well. Registration that day begins at 7:00 am and the shorter rides begin at 9:00 am.